Our research team was hard at work over the past few days. Not only were they able to call this downside price swing 3+ weeks in advance, they also called the market bottom within 0.5% of the absolute lows. Now, they have put together a suggested “map” of what to expect in regards to price rotation, support, resistance and the eventual price breakout that we are expecting to happen near or after November 8~12. Today, we are sharing this detailed map with all of our followers. Our research team has honed their skills over the past few decades by studying market correlations, price relationships, advanced price modeling and more. Our objective is to be able to identify price patterns, opportunities, and setups while attempting to accurately predict the future of price so that we can keep our followers and members uniquely aware of future opportunities. As you can imagine, it is not an easy job and we often take heat for some of our research posts. Today, we are sticking out neck out (again) and attempting to predict the future of the ES price rotation as this deeper rotation continues to play out. Our research team believes it has identified key price levels and dates/times that are relevant to this future price rotation. By no means is this research set in stone in regards to exact dates/times. These are suggestions which we believe to be accurate based on our research and analysis of the markets. Use them as guides to how this price rotation plays out. This first chart is a Daily ES chart that shows three very important components of the current market price rotation. _ The Support Zone below the recent lows is actually very critical to the true understanding of price rotation. As long as this support zone is not completely breached, prices should continue to push higher overall. _ The Rotation Zone is where we believe the price will continue to consolidate within a fairly tight range before the November 8 ~ 12 bottom sets up. Volatility will continue to be greater than normal throughout this Rotation Zone. _ The post-November 8 ~12 breakout is likely to attempt to target 3131 initially (a Fibonacci extension target) and we believe this move higher could explode fairly quickly. Now that we have explained the general sense of our research, let’s dig into the numbers a bit. Our expectation is that a price peak will occur near early morning trading on October 26 (morning session in NY). We believe this peak will end near 2830 (a Fibonacci 50% retracement level) and we believe an extended basing pattern will precede this price peak. The extended basing pattern, which is expected to end near 2770 (a Fibonacci 25% retracement level) is already starting to form and should last from now until near October 23 or 24. We believe the upside move between the end of the basing pattern and the October 26th peak will be very fast and end fairly quickly – so be prepared. The October 26 price peak will set up a very important component of our final analysis – the peak-to-peak price channel (highlighted in YELLOW now) and will allow us to determine when and where price volatility predicts the breakout move to occur. Our research team believes another bout of extended basing will occur after the October 26th peak that will likely push just below the 2771 support levels (to near 2750) retesting the Support Zone and presenting a “false low price breakout” pattern that may sucker many longs out of the market (and potentially set up massive short seller pressures in the market). This move may be critical to the eventual upside breakout that we are predicting. Think of it like this, Fibonacci price theory suggests that price MUST attempt to establish new higher high prices or lower low prices at all times. Failure to accomplish these new price levels results in a consolidating/congesting price trend that typically forms as Pennants or Flags in price. Near the Apex of these pennant/flag formations, false breakouts (or what we call “washout lows or highs”) are common. These are price functions that operate as a “shakeout move” where price searches for direction and where buyers and sellers are stacked on top of one another attempting to ride the next wave. Price MUST attempt to establish a new higher high or lower low – so it must attempt to rally up and break the 2945 level or it must selloff ant attempt to break the 2712 level. We expect extreme volatility near or after the November 8~12 apex setup. Price could fall deep into the Support Zone before reversing higher with a bigger rally that attempts to run well above the 2945 level. The vertical blue line is the November 8 date where we expect the absolute bottom to form and where we expect the next big price rally to initiate. Near after this date, we expect the price to rotate with greater volatility and attempt an upside breakout move near or after November 12. The key Fibonacci levels at 2771 & 2829 are certain to become key price rotation levels near this November 8 ~ 12 price breakout. At this point, we have outlined some very detailed and structured price rotation levels that should clearly help you understand what is transpiring within the US Equities markets right now. 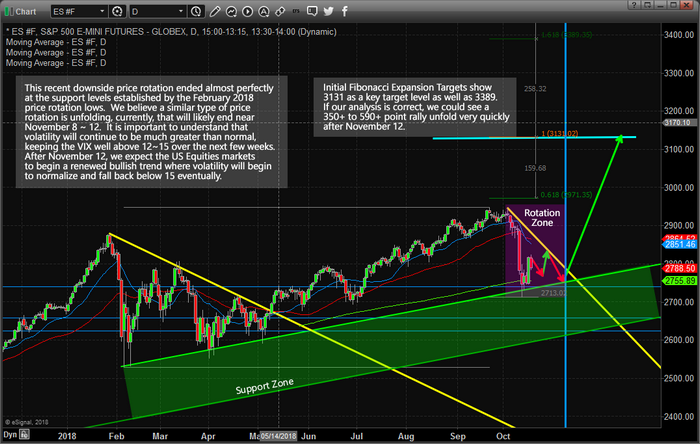 If you take only one thing away from reading this article, please understand the Support Zone that we’ve highlighted on our charts is super-critical to the ability for the US Equities markets to continue to push higher. If this level is completely breached by lower prices (prices falling all the way below these price channels on the Daily chart, above), then our predictions of price rotation, extended basing and an ultimate upside price breakout are invalid. 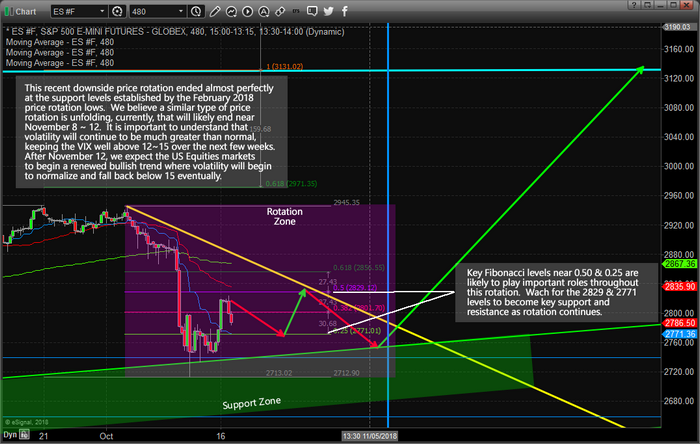 This Support Zone MUST hold for our analysis to become valid.